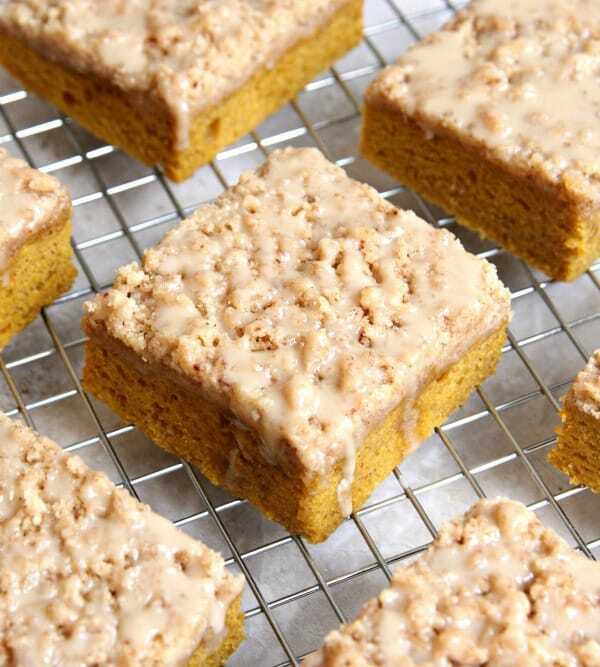 What do you get when you add pumpkin to a delicious coffee cake recipe? 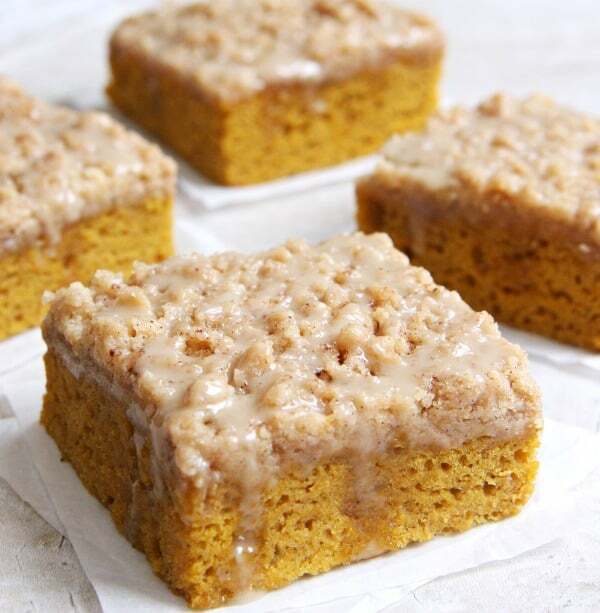 The most delicious Pumpkin Coffee Cake! And, since today officially marks the first day of fall, it’s the perfect time of year to start sharing pumpkin recipes. 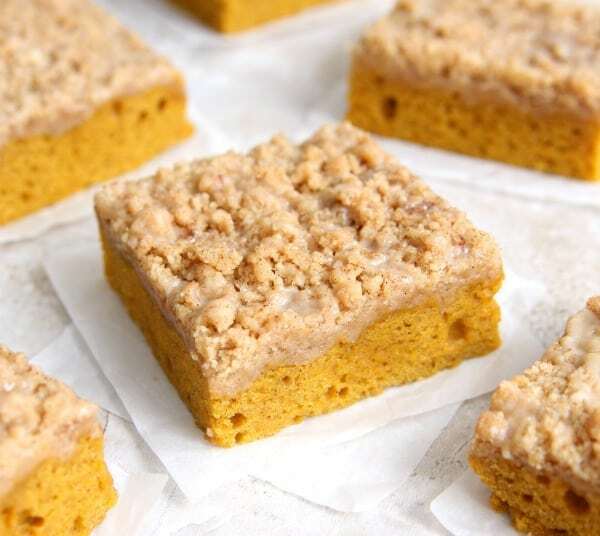 I was originally going to make pumpkin bars but then I decided the bars needed a streusel topping. And you can’t have dessert without icing. So then I realized I was creating more of a coffee cake instead of pumpkin bars. But you know what? I’m not sure it really matters what you call this because it tastes great and they’re perfect for breakfast, dessert and even an afternoon snack. My favorite thing about this recipe is that I used Pumpkin Pie Spice International Delight Iced Coffee in both the coffee cake and the icing. Yum! 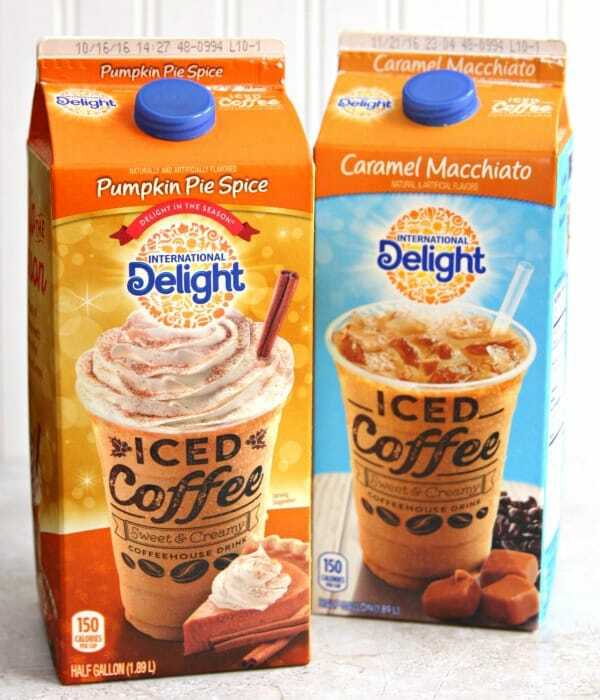 You know you can’t go wrong with anything that includes Pumpkin Pie Spice International Delight Iced Coffee. Have you tried it yet? I found it at my local Walmart in the refrigerated tea and juice section. I originally thought it was going to be with all the coffee creamers but then I found it in it’s new location. My hubby and mom both love everything pumpkin and since my mom was in town last weekend, I picked it up so we could all try it. All I can say is – it’s SO GOOD and you have to try it. If you love coffee as much as I do, then you will love International Delights Iced Coffee. I also bought the Caramel Macchiato. I go back and forth between that and the Mocha. But now that they have Pumpkin Spice for the fall, I might just have to have my refrigerator stocked with all three. Not only does it taste great, but it’s so easy to just pour over ice and enjoy a cup of iced coffee. And now I’m going to start adding it to more recipes. And you can’t drink iced coffee without a cute glass. 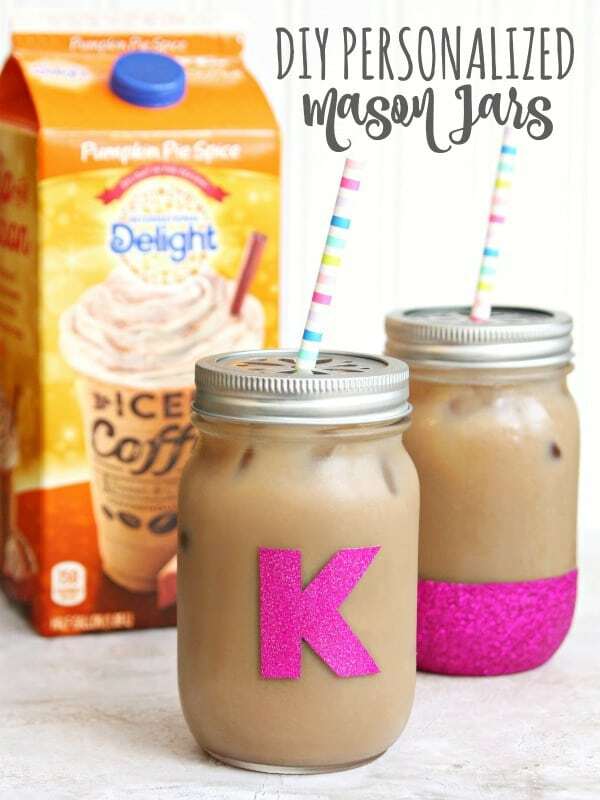 You all know that I’m obsessed with mason jars, glitter and all things monogrammed, so I made the easiest personalized mason jars. I was originally going to stencil letters and use my dishwasher safe Mod podge. But then I found glitter vinyl on sale and decided it would be much easier to cut out letters. No dry time needed and the jars can be hand washed. I can’t believe I never thought of this before. This has to be the easiest project and you don’t need a fancy vinyl cutter to do it. It’s especially easy if your name starts with a letter that’s easy to cut out. 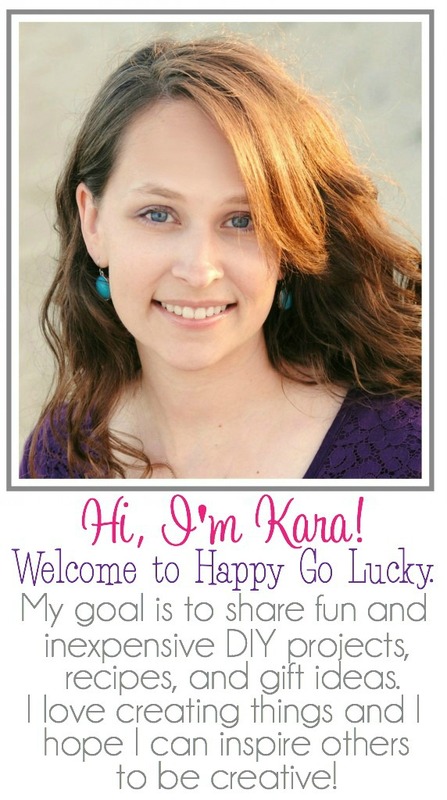 Lucky for me, my name starts with a K. It might be harder if your name starts with a Q or a B. Some craft stores sell vinyl letters that would probably work too. 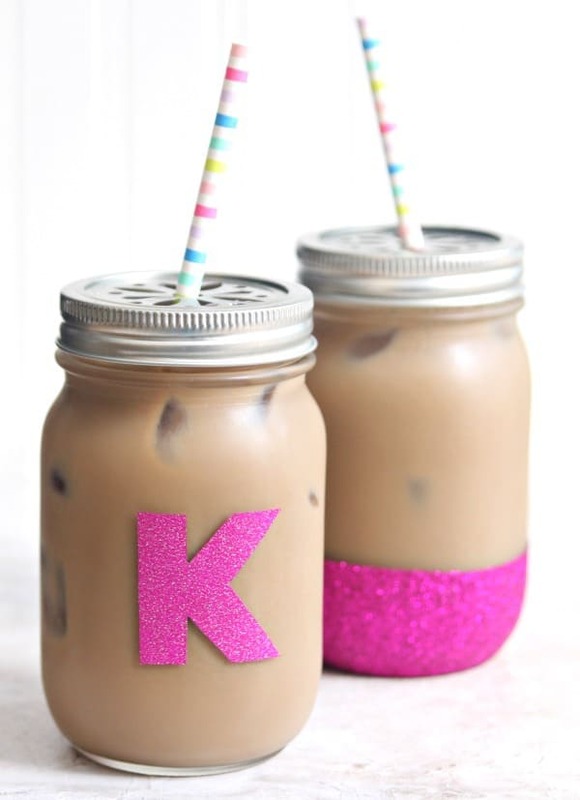 Look how great it goes with the pink glitter dipped mason jar I made. Oh, this just makes me so happy! Either way, I’m so happy that it’s officially pumpkin spice season! Preheat oven to 350°. Line a 9×9” baking dish with foil and spray with cooking spray. In large bowl, whisk together pumpkin, Greek yogurt, milk and ID Pumpkin Spice Iced Coffee until no lumps remain. Whisk in sugar, baking powder, salt, and pumpkin pie spice. Gradually stir in flour – batter will be thick. Pour into prepared pan. Make the crumb topping by adding flour, brown sugar, and pumpkin pie spice to a medium bowl. Mix in cold butter with a fork or fingers to create crumbs and clumps. Sprinkle evenly over cake batter. Once the cake has cooled completely, whisk the confectioners sugar and ID Pumpkin Pie Spice Iced Coffee together until smooth. Drizzle glaze over cake.